In recent months, the government newspapers like Straits Times and CNA, have been been spreading fake news of Lee Hsien Yang’s wife, Lee Suet Fern, being guilty of professional misconduct. Singapore’s mainstream media is ranked 151st in the world for credibility. The Attorney General, who is Lee Hsien Loong’s former private lawyer, commenced legal actions against Lee Suet Fern as soon as he became AG, in a veiled attempt to invalidate Lee Kuan Yew’s last will. In his last will, Lee Kuan Yew specified that the 38 Oxley Road house is to be demolished after his death. Prime Minister Lee Hsien Loong however wanted to turn the site into a memorial, so he could tether his political image to his father’s popularity. The move is also aimed to pave the way for his son, Li Hongyi, to become the next Prime Minister. Lee Hsien Loong is currently seeking to circumvent the last will, through the abuse of his premiership powers by enforcing a legislation under the Preservation of Monuments Act. The PAP dictator is also persecuting his younger brother’s family members, sister-in-law Lee Suet Fern for allegedly “professional misconduct” and nephew Li Shengwu for allegedly “contempt of court”. 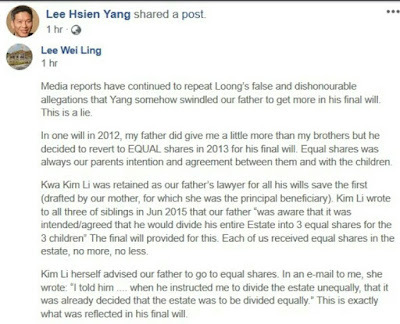 The other two siblings – Lee Hsien Yang and Lee Wei Ling – are defending the last will in their own way. Lee Wei Ling isolated herself residing in the house alone so the National Heritage Board could not enforce the Monument Act legislation. Lee Hsien Yang is currently supporting and funding opposition political elements, hoping that his dictator brother Lee Hsien Loong will lose governance in the coming general election expected to take place later this year. walaneh! shock Bro, family disputes became public issues ah! Worried Why can't they just settle behind closed doors leh? How can the head of a rich nation, PM Lee being called a dishonourable son (person), a liar, and abuse of power and yet, powerless to take action? What will the world think of the people in Singapore? Without any sign of a peaceful solution or discussion for a ceased fire agreement in sight. Soon the attack from PM Lee's siblings and nephew will be intensified and could even be more vigorous and powerful than ever before..
Hyflux investors got fingers burnt. So how can PAP MPs proposed and approved electricity rate increase? How come singapore power still charge us sky high electric bill? and PAP just keep quiet ? We all needs electricity for our daily lifes, and it had become a necessity rather than a luxury. Therefore, we don't have a choice if the price of electricity is doubled in years to come. Over 800 individuals have petitioned President Halimah Yacob to appoint a commission of inquiry to look into Hyflux. About 34,000 perpetual securities and preference shareholders who invested in the water and power company are owed a total of S$900 million, but only stand to receive a recovery rate of 10.7 per cent comprising of 3 per cent in cash and 7 per cent in equity. Calling these retail investors “risk averse and non sophisticated investors,” the online petition noted that these investors chose to invest their hard-earned funds into Hyflux as they considered the company’s water desalination plant a strategic national asset. The online petition comes as shareholders and investors are asking why Hyflux’s audit firm gave the organisation a clean bill of health in its annual reports over the last decade, instead of flagging the risk that Hyflux would become embroiled in heavy debt. KPMG has audited Hyflux since 2008. Hyflux slipped into the red for the first time in 2017 since it was listed in 2001. Two months later, it filed for bankruptcy. The move shocked investors who had believed the company was healthy. Indeed, Hyflux’s financial statements before this point did not give cause for concern since it was prepared on the basis of an accounting method that assumes the company will remain solvent and operational indefinitely until proven otherwise. Asking the President to intervene, the petitioners asked her to “appoint a commission of inquiry to take an independent review of this matter.” The petitioners requested that the review should look into whether adequate steps were taken to protect the interests of investors. View the petition, which is nearing 1,000 signatures, HERE. One of the individuals who signed the petition is former presidential candidate and ex-NTUC Income CEO Tan Kin Lian, who funded the recent protest at Hong Lim Park against Hyflux’s restructuring plans. The petition was organised as Singapore’s regulators have initiated a review into Hyflux to discover whether the debt-laden firm has breached regulations. In a joint statement to Channel NewsAsia, the Monetary Authority of Singapore (MAS), the Accounting and Corporate Regulatory Authority (ACRA) and the Singapore Exchange Regulation (SGX) said they are “currently reviewing Hyflux-related disclosure issues”. MAS, ACRA and SGX are also looking at “compliance with accounting and auditing standards, to determine if there have been breaches of listing rules and/or the relevant laws and regulations”. Hyflux, which is nearing the end of a court-sanctioned debt moratorium on 30 Apr, told the publication that it is “cooperating fully” with the regulators. Analysts have said that the odds of liquidation for Hyflux have risen, especially after the Salim-Medco rescue deal fell through with no assurances of another such deal. The Indonesian consortium was touted to be a “white knight” and the only hope for the retail investors of Hyflux who have been left high and dry. On Monday, Hyflux filed a writ of summons in the Singapore High Court against the Indonesian consortium “to commence an action against the investor for repudiation of the restructuring agreement” as well as to claim a deposit of S$38.9 million. What does the $70 passport renewal fee tells you about this Govt? I have often heard this complaint of the high passport renewal fee, but just shrugged it off as another of those daily complaints by typical Singaporean. After all, you pay it only once in 5 years, as the passport is valid for 5 years. But when a coffeeshop cleaner started grumbling about the fee, and that he will not be renewing his passport, I decide to put myself in his shoes, and analyse the situation he is facing that is so serious, that it caused him not to have a passport at all. More importantly, what he doesn't understand is, why the regime of LKY charged only a token sum of $10 for a new passport but the current regime is charging such high fee that it deterred him from having a passport altogether? Let's look at the numbers. There are about 3.3 million Singaporeans, and over 5 years, these people would have paid 3.3million x $70 or about $47 million to the government's coffer. Divide that by 5 and you have approximately $9.4 million per year of collection. Based on what we heard from Heng Swee Keat, every year we have a surplus of $1 billion to $10 billion, every year. Except for the recession year some time in 2009, which happened only once a lifetime. And that is also because the Govt chose to dig into the Reserves, even though they can chose not to, and we would have been OK. Important Reminder - One billion is 1,000 millions. So even if the govt decide to pay for all the passport renewals, it will be less than an insect bite to the Govt. So why did this new regime under Lee Hsien Loong, is determine to hit Singaproeans with "fine" for renewing their passport? Just to put things more in perspective, the casino levies collected from Singaporeans and PR came to $134 million a year in 2017. More than enough to pay for all passport renewals, by more than 13 times. And I haven't even talked about other forms of gambling levy in other legalized gambling outlets, and other form of taxes, GST, COE, etc. By the way, passport fees are regressive, just like the GST. It means the poor will be the hardest hit. It is like robbing the poor to pay for the rich. You may google to find out why GST is regressive, it will be another topic for now. Questions surfaced after this simple analysis. 1. Wouldn't it be better politically for him to stick to previous policy of the previous administration? Give something back to the people? In this case, every Singaporean will benefit. Take it as a personal right for all Singaporeans to travel freely, without any financial barrier or restriction? 2. This analysis also threw out the govt's argument that fee had not been increased over the years, and the need to cater for rising cost. It is obvious that it is a blatant lie, a total rubbish in more layman's term. Is it not? 3. All these fee increases, in this case by over 7 times, would have taken away the so-called cash distribution in the form of GST rebates. Last known was $300 annually for those eligible. Would it not? For all the items above, looking at it from a non-partisan or non-biased view, it is quite obvious that the govt doesn't really care too much about it's people when come to money. In fact, the govt's attitude is that of, EVERY CITIZEN OWES THE GOVERNMENT, (regardless of your financial background, race or religion) and not the way around. The govt has created a world class country that is safe for you to stay and be proud of, you must pay them for that, regardless. So they will not hesitate to impose, if deemed fit, any form of charges, fees, rates, fares, taxes and salary increases for themselves. And, if deemed fit, to increase the existing ones. Whatever form of subsidies or grants that they offer you, will be taken back from you eventually in other forms. And all these money collected from you, the people, will be channelled to the Sovereign Fund held by Temasek and the GIC. The monies will be invested oversea, not you and me. Although there are strict provisions for it to be used for the country under very unlikely circumstances, you are not likely to ever see those money again in your lifetime. For the people, these monies can be written off as bad debt. Let's hear it from some veterans, past and present, and the public in general. Some names of authors are not given basically to protect them from any persecution by the dictator government. This is the words of our great leader of the founding generation, ex-Deputy PM Mr. Toh Chin Chye on why raising the withdrawal age is a breach of trust by the dictator government. "Dr Toh Chin Chye: We need to clearly define the boundaries within which the CPF will be used for retirement. We must spell that out. You just cannot say, “Let us raise the withdrawal age to 60 or 65.” It must be 60. It must be 65. Now, at which age? This Paper does not contain any calculation at all to say what will happen if it is withdrawn at 60, or what will happen if it is withdrawn at 65. If I were a person who has no relatives, if I were a widower with no children, all the assumptions made by this Committee – that you will be looked after by your children – then I do not qualify under any of these grounds. Mr Speaker, I think fundamental principles are being breached. The fundamental principle is this. The CPF is really a fixed deposit or a loan to Government, which can be redeemed at a fixed date when the contributor is 55 years old. If I were to put this sum of money in a commercial bank and, on the due date I go to the bank to withdraw the money, the manager says, “I am sorry, Dr Toh, you will have to come next year”, there will be a run on the bank! It is as simple as this, that the CPF has lost its credibility, the management of it. 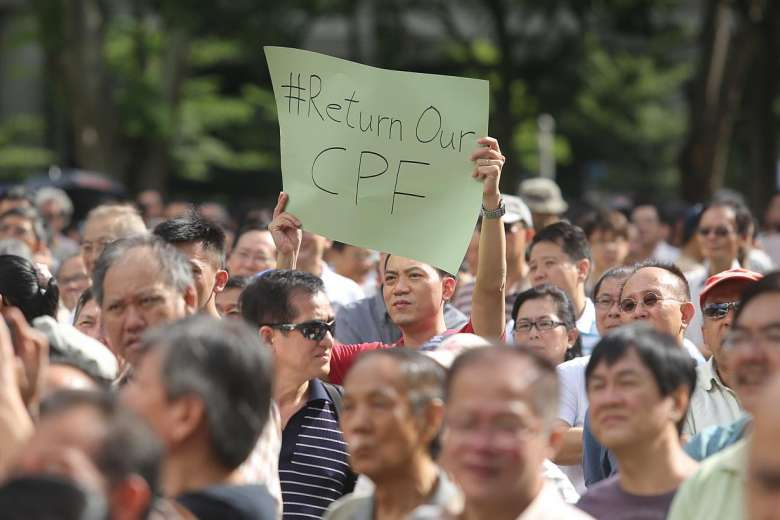 This is fundamental…This is the nub of the problem – the credibility of the management, gradual encroachment into the purpose of the CPF which was instituted really to provide for retirement." Imagine you put your money in a bank as 1yr fixed deposit. After one year you go to the bank to collect the $$. Banker say cannot auto extend for 10yrs. You ask why banker say we worry about you people have bad habits take tge money will go anyhow spend so i am doing it for your own good. In any case i think you need insurance and annuities I think it is good for you so i already enroll you. If you want you can use the money to service housing loan with us...otherwise cannot touch until 10yrs later for your own good. Just like banker, those in control wont tell the real reasons why they do this instead they use a pretext and claim they are doing for your own good. There are many reasons why the govt delays. and control access to your own fund:..
1. They can lower their own expeditures by enrolling you on various insurance and scheme using your CPF for programmes that should be supported by govt revenues. 2. Second is the the CPF funds is loaned to sovereign wealth funds GIC/Temasek for investment purposes and they keep the excess returns. This create a big conflict of interest because the more they delay your access the more they can exploit your funds. In fact of you go read the early speeches of Goh Keng Swee, such an arrangement was used to build up reserves when Singapore was poorer. 1. To require all excess returns from use of CPF for sovereign wealth investment to be returned to account holders....all countries and major pension do this. The current practice create a conflict of interest in policy making should be stopped. 2. Stop compulsory insurance schemes that potentially drain cpf accounts over time. You basically go onto that slippery slope...they can create various schemes to use CPF to reduce their budget expenditure on healthcare and elderly care etc by tapping CPF into various schemes. Today the govt raise withdrawal age and included all sort of scheme and insurance etc so that they are not indebted to people. Why should they care about trust ? They should take into the consideration of people's life span and the enjoyment we needed. Their computation is based on how to accumulate as much at the govt side from the people. Whether you have quality of life or lying in hospital when your cpf money finally come is not their concern. They only concern is how to keep the money from us. I have a friend, her mother passed away at the age of 79 yr old. Just imagine, if push to 65, only have 5 years to enjoy and probably more than 40 years of hardship. You seriously think they are in politics because they love the masses and public? You are a politician because you love to control, love to come up with policies and rules for the masses. The handshake and walkabout are just ways to PR. Try having them walk the ground everyday and without any media coverage. You think it will happen? They rather be playing golf somewhere. “I tried speaking to my Member of Parliament, but he did not help. I’m not happy with it,” he added. Is Health Care Really Unsustainable Hard Choice? Right after an uneventful Budget Speech, the hopeless PM is now preparing the cows for milking, this time from Health Care. 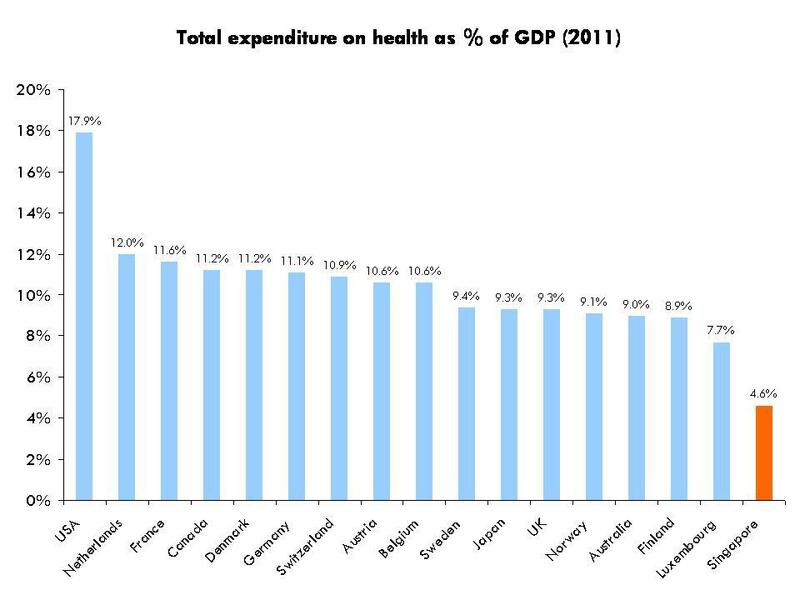 It seems Health Care is unsustainable and hard choices will be made, presumably more taxes, Health COE, and whatever it takes to push the buck back to the people. What is not said is that, he will continue to accumulate billions in Budget surpluses to be channeled to external investments via Temasek and GIC that don't benefit the people in general. If resources are not managed properly and prudently, nothing is sustainable. For example, the billions spent on defence. How is it sustainable and is for what? While necessary, but why the huge part of our budget? It can't even deter the Malaysian govt boats encroaching into our water. And of course what is really unsustainable by any world standard, is the huge cost of our Cabinet and the astronomical ministers' pay, in particular white elephants like Senior Ministers and ESMs. If we are a Meritocracy, then where or what is the merit for their existence? SINGAPORE: Hard choices will have to be made as the Government considers ways to fund future healthcare spending, said Prime Minister Lee Hsien Loong on Saturday (Mar 23). 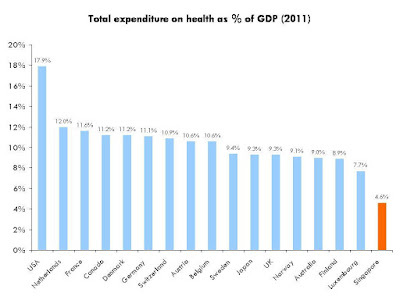 Healthcare expenditure currently exceeds S$9 billion and is set to rise even further. Eventually, this will be unsustainable, Mr Lee said. “In the medium term, we have to find new ways to fund this healthcare spending. But at the same time, we have to think hard about what we must spend on, and which drugs and procedures are cost-effective,” he added. “Hard choices weill need to be made, and I hope we will have the support of Singaporeans in making them.” Mr Lee was speaking at the opening ceremony of Sengkang General Hospital and Sengkang Community Hospital. Came across this interesting pic on the government's achievements over the preceding 5 years, in WhatsApp. A good snapshot of what happened but it also highlights the kind of problems we are facing these days with this government. While data hacking and data security issues will take time to resolve or reduce, the uncovering of new issues every few months means that there could be many hidden skeletons in the closet. Action plans on PMETs seems like more talks than actions, and the usual blame on external factors beyond our celebrity ministers' control. Corruption cases, my opinion on this is the same as some PAP supporters, that corruption can never be eradicated totally, especially in a country with almost absolute power, they can even rename corruption to something else, like donations, gifts or salaries, for examples. The water issue is generating a long term windfall for the govt, thanks to Mahathir. You can expect the price of water to trend upward, with PAP giving the same excuses (so that we won't be threatened) while continue to pay cost of only 3 sen to Malaysia for a long time to come. So head or tail, Ah Loong wins. They squeeze the public with the fear factor that always works. Singapore is never in fear of having no water. They have already built enough safeguards over the past 20 years to prevent that from happening. This, they will never tell you. As for most expensive city, regardless, they will continue to raise the GST and hold your money in the Reserves for investment, as their Sovereign Fund, and accumulation of the Reserves for the illusive "rainy" day which will never come in yours or my or your kids' lifetime, as they continue to accumulate billion$ at your expense. What is rainy and what is not rainy is also decided by the absolute power that be. The only rainy day that can happen to Singapore is when we discovered we have nothing left in our Reserves, when a new government took over. PM Lee finally Speaks Up About Aloysius Pang’s Passing 3 weeks after Aloysius Pang’s death, not verbally but in Facebook post, which is unacceptable given that he sat through the whole Parliament proceedings that discussed about all 4 deaths over the last 17 months. He showed no urgency to even stand up and say a few words of condolences to those who lost their lives prematurely, during that Parliamentary session. In fact, during that 17 months, there were 9 NS men deaths. But they discounted those deaths from suicide and exhaustion, focusing on only training accident. This lack of response, or procrastination by the prime minister is a Hallmark of his PMship, mainly out of fear or shame, and most likely out of indecisiveness. You will never see the take-the-lead attitude of Theresa May, or unwavering decisiveness of Donald Trump, from this mediocre personality. But he's paying himself millions, many times more than Trump and May, for his sloppy work and lacklustre character. When Malaysian boats intruded, we heard nothing from the PM in Parliament either. He left it to his lackeys to do talking. It was on 31st December during the New Year speech that he mentioned about problems with Malaysia and other countries. About two months after the first intrusion. Many angry Singaporeans are taking to social media to voice their unhappiness. So Many NSmen died, Defense Minister should resign. Here is some details from Mustsharenews.com on his Facebook's response to Aloysius Pang's death. PM Lee gave his take on the recent Singapore Armed Forces (SAF) training-related deaths that have caused distress among many Singaporeans. In his Facebook post, PM Lee assures Singaporeans that the SAF treats safety very seriously, and repeated Minister Ng Eng Hen’s promise to strive for 0 training fatalities. Here’s his post in full, we also break it down for you after the jump. Incidents are “very painful”. Mr Lee started his post by touching on the recent training incidents that have caused “precious lives” to be lost, and how this has affected all Singaporeans. Describing these incidents as “very painful”, he notes how “heartbreaking” these must have been to Singaporeans, especially for the families involved. He also acknowledged that when this occurs to a public figure like Mr Pang, the “emotional impact is greater, and the loss is even harder to take”. SAF places “enormous emphasis” on training safety Despite recent incidents, PM Lee wrote in his post that the SAF places “enormous emphasis” on training safety. According to PM Lee, after every fatal accident, the SAF carries out investigations to identify the cause of the incident. And when causes are identified, the SAF takes steps to improve its processes to prevent similar incidents from happening in the future. Even though having 0 fatalities sounds like it might be impossible, PM Lee hopes that the SAF will strive towards it, because “every life is precious”. PM Lee draws on his personal experience as a commander in the SAF. PM Lee then went on to speak about his personal experience. During his early days as a unit commander, he was responsible for his men’s training, safety and welfare. This, to him, was similar to “standing in” for his servicemen’s parents. Then, when he served on the General Staff, PM Lee was directly involved in the aftermath of SAF training incidents. What the SAF should continue doing and what it should stop. How to keep servicemen safe while fulfilling the SAF’s mission. Moving on, PM Lee once again reiteratedthe importance of having a capable defence force. Despite the tragic incidents of late, the SAF must continue training and realising its operational obligations. That’s because We cannot outsource our security and defence to anyone else. According to him, we have a “strong and well-trained” defence force to thank for the peace, security, and good international ties that we enjoy today. PM Lee hopes S’poreans can see things in perspective. In conclusion, PM Lee took the opportunity to thank Singaporeans for their support towards the SAF, and in particular our national service. He hopes that Singaporeans will be able to see things in perspective the next time “something goes wrong”. Even though we shouldn’t ignore the SAF’s imperfections, we should not forget the SAF’s progress over the years, and the vital part it plays in keeping our country safe. So Is The PAP Bribing the People with $300? In his own words, PAP leader Chan Chun Sing claimed that giving $300 to Singaporeans is tantamount to giving bribes. That is exactly what his govt is doing now in the latest annual budget day announcement by Heng Swee Keat, the so-called Finance Minister. Chan repeatedly put words in the mouths of Singaporeans by insisting that Singaporeans are not so easily bribed. So much for the legalization of corruption here. Not surprisingly, he mentioned nothing about the massive bribes he is getting in the form of exorbitant salary payment never seen before in world history. Had Your MP Ever Spoken For You in Parliament? The title of the above video is, VOTE THEM OUT: PAP MP's Do Not Speaks For You in Parliament. This is really a no-brainer title as we know these MPs are mediocre Yes-men. They were specially selected and approved by the failing dictator himself. They owe him a lifetime of success. He is their God of Fortune. Why would they want to speak for a bunch of hopeless people called Singaporeans, unless asked by their God of Fortune to do so? How and what can these people benefit the MP if he speak for them? Nothing. But the people have their all important "votes"? You may ask. Wrong! Their votes don't matter at all. Read why your vote doesn't matter anymore, 5 articles below. Why is PM Lee elevating Leong Sze Hian to oppie Sainthood? From obscurity to fame and possibly a key opposition figure in the coming general election, thanks to the redundant PM Lee effort in reading every blog post that criticized him, probably with the help of some Pap lackeys. Blogger Leong became a star overnight by the unwitting action of a sickly and failing Prime Minister. Singaporean blogger Leong, is fighting back after Prime Minister Lee Hsien Loong sued him for defamation for sharing an article on Facebook linking the leader to a corruption scandal. Observers say the government is increasingly targeting online criticism – the case against blogger Leong Sze Hian comes the same month the editor of a news portal was charged with defamation. The prime minister lodged the defamation suit against Leong earlier in December for posting on his Facebook page a link to an article alleging that Lee was the target of an investigation in neighbouring Malaysia over the scandal at sovereign wealth fund 1MDB. 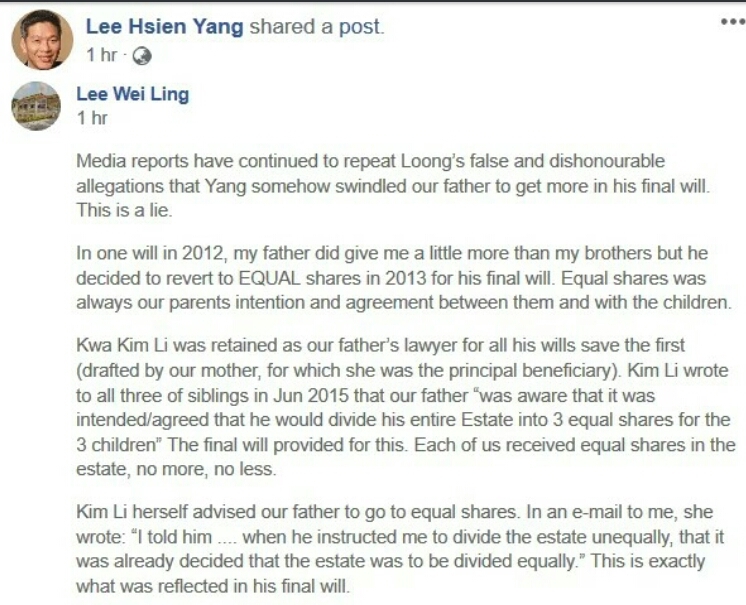 Lee said the article, originally published by a Malaysian news portal, was false and without basis and that Leong had reposted the link to smear his reputation. The article, titled “Breaking News: Singapore Lee Hsien Loong Becomes 1MDB’s Key Investigation Target — Najib Signed Several Unfair Agreements with Hsien Loong In Exchange for Money Laundering”, was sourced from another blog, States Times Review. States Times Review describes itself as “formerly a Singapore news media based in Australia” and now “a personal blog in response to Singapore's latest censorship laws”. Singapore was the first country to legally act on the 1MDB saga. It has fined eight banks and convicted four people linked to the Malaysian fund since its investigations began in 2015. In September, a Singapore court also ordered the return of some S$15.3 million (RM46.3 million) misappropriated from 1MDB to Malaysia. Malaysia’s former leader Najib Razak and his cronies are accused of having stolen billions of dollars from 1MDB in an audacious fraud that spanned the globe. Najib has been charged but denies wrongdoing. Leong, a regular critic of government policies, has now lodged a countersuit against Lee for alleged abuse of the court system. “The predominant purpose of the claim is the use of the legal process to chill freedom of expression in Singapore,” said Leong in his suit, which was posted on Facebook on Wednesday along with details of his defence. He said all he had done was to make the article available on his Facebook page “without embellishment or comment” for less than three days. Leong launched a crowdfunding campaign earlier this week aimed at raising S$10,000 (US$7,280) towards his legal fees – a fund to which Lee Hsien Yang, the prime minister’s younger brother, said he had donated a “meaningful sum”, according to local news website Today. Singapore’s Prime Minister and his two siblings, the children of the city state’s founding father Lee Kuan Yew, have quarrelled bitterly over the fate of their parents’ bungalow. The Prime Minister’s siblings claim their father always wanted his house to be torn down after his death, but a ministerial committee has been studying future options for the house, including preserving it partially or completely. Ruling People’s Action Party, co-founded by Lee, held key meetings in the basement of the property in the 1950s. Amid the feud, Lee Hsien Yang’s son, Harvard academic Li Shengwu, made a Facebook post that resulted in the Attorney General’s Chambers in Singapore launching contempt of court proceedings against him last year. Earlier this month, Terry Xu, editor of Singapore news site The Online Citizen, was charged with defamation for publishing a letter that alleged corruption among the city state’s leaders. Singapore is regularly ranked among the world’s least corrupt countries and its leaders are sensitive to accusations of corruption. With Singapore’s media scene dominated by pro-government publications, criticism of the authorities is mostly expressed online. Phil Robertson, Asia's deputy director of Human Rights Watch, which has been critical of Singapore's laws limiting critical speech and peaceful assembly, said the Singapore government was engaged in bullying tactics against STR. "If a story is inaccurate, Singapore should refute it with facts, not shoot the messenger. Actions like these show that when it comes to media freedom, Singapore is no better than repressive regimes like Vietnam or Laos," Robertson said.